1x XML L2 LED 80000LM Tactical Flashlight. That's what you get with a tactical flashlight like the Shadowhawk. The X800 flashlight is made of indestructible aircraft aluminum. This light can be seen from miles away. 3 x AAA Alkaline batteries included. High & low power light modes. Designed to last 15 years. Shatter proof lens. Pivoting head. 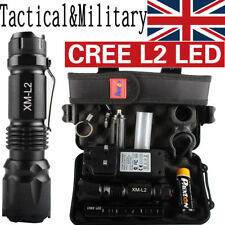 1x XML L2 LED 20000LM Tactical Flashlight. That's what you get with a tactical flashlight like the Shadowhawk. The X800 flashlight is made of indestructible aircraft aluminum. This light can be seen from miles away. HEAD TORCH. Compact, tough and lightweight, this is a remarkably powerful head torch for its size. The head torch section is made from robust super tough high grade aluminium. The head torch uses 3 x AAA batteries (not included). 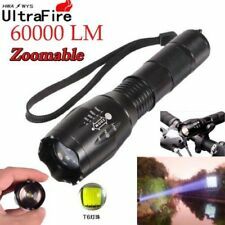 1 x Ultrafire T6 LED T6 Zoomable Flashlight. Suitable for Flashlight Torch. LED Type: T6 LED. 1x UK Plug. Light Color: White. Red light : Charging. We will always here to solve them for you. It won't help the problem to be solved. Aluminum 6" Tactical Pen Glass Breaker Sport Self Defense Survival Military Pens. The Tank Engine Tender Wooden Magnetic Railway Train Toys Car Kids Gift Toy UK. 1 x Ultrafire T6 LED T6 Zoomable Flashlight. Zoomable 80000LM Flashlight Q5 LED Focus Torch Light Case Mounts for Camping. LED Zoomable 35000LM T6 18650 Laser Light Flashlight Light Lamp Torch Bicycle UK. Zoomable 20000LM 4-mode LED 18650 Flashlight LED USB Cable Torch Light Hiking. Switch Location: Tail of the flashlight. Emitter BIN: T6. 1x T6 60000LM LED Flashlightï¼Not includer battery/clip/holderï¼. It won't help the problem to be solved. We will always here to solve them for you. 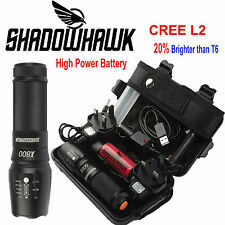 80000LM X800 Shadowhawk Style Flashlight XM-L L2 LED Torch Zoomable Function 1PCS 3.7V. 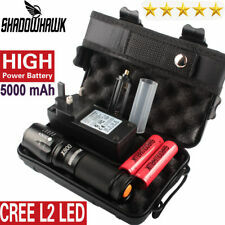 1x XM-L L2 LED 80000LM Tactical SHADOWHAWK Flashlight. That's what you get with the X800 a new Military Grade tactical torch. Battery: 3 18650 Battery. Charging Mode: Micro USB Charging Interface (with free USB Cable). Light bulb: XHP50. Our Office Hours Are . 4 Modes LED Light: It can not only be used as a headlamp, but can work as a camping lantern by putting it in the box and hanging it or being attracted to the iron surface. You can use it for Hiking, camping ,climbing and cycling and others outdoor activities. The body of this flashlight is built of high quality aluminum alloy, and it has a very solid construction. Specifications: Light bulbs: T6 LED. Suitable for Self Safety, hunting, cycling, climbing, camping and outdoor activity etc. with battery,use directly! powerful,lowest price! Super Bright, blinding Effect. Suitable for Self Safety, hunting, cycling, climbing, camping and outdoor activity etc. Reflector: Convex Lens. Model of LED: T6. 3-mode adjustable Brightness,High/Low/Strobe. 1 x Headlamp. Model of Battery required: 3 x AAA (Not included). Number of LED: 1. Light Color: White. Matte surface and anti-slip. One button switch : On, Off. Strong, weak, flash, three different illumination modes. 2 x Headlamp &headband. LED to provide a strong, clean lighting. We are committed to providing good quality products. Weight: 49g. Mini headlights, weighing only 49g, easy to carry and wear. Brightness: 15000lm. 1 x XM-L l2 15000Lm Headlamp. LED Model: XM-L l2 LED. Life span:100,000 hours. 90° Adjustable Headlight, Very Convenient. Internal wiring applies the high efficient booster circuit. 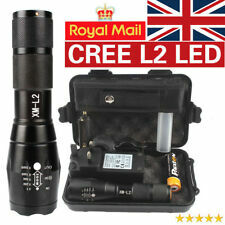 LED Bead: CREE XM-L2. Multifunction: Bicycle Light Headlamp, not only Bicycle Light, but also be mounted on the included headstrap mount as a headlamp for outdoor sports such as trail riding, camping, fishing, hiking, trekking, hunting, night flying, sailing, caving, commuting. 1 x Headlamp &headband. Material: PVC. Energizer Vision LED Headlight Headtorch 100 Lumens. Condition is New. Dispatched with Royal Mail 2nd Class.